Being a Lazy Girl sometimes we don't always feel like making dinner.. who does!? But that said, we gotta eat. So dinner must get made. It would be nice to eat out every night, but that is not practical. 1. Don't just make one family serving of rice, make the whole bag. Use the amount you need for tonight's dinner and freeze the rest in dinner portions. Rice freezes really well and all you need to do is heat it up for another dinner. 2. Serve fresh fruit or veggies as a side. Baby carrots with dip or sliced apples are a perfectly acceptable side dish, are nutritious and help get dinner ready fast. 3. On Sunday make a huge pot of soup (do it in the crock pot if you are a really Lazy Girl). Make it a "flexible" soup, like chicken and veggies. On night one add in one of those frozen bags of rice for Chicken and rice, on another night add in a can of beans, squeeze in a little lime and top with cilantro and avocado for a Mexican flavored soup. Score! Two meals in one. 4. Make Breakfast. Scramble up some eggs, toast some break and throw in a side of fresh fruit. Easy mid-week meal. 5. Take out all the left overs from the fridge and have a buffet. Less waste AND you don't have to cook! Don't over think dinner. I think sometimes we (myself included) over think it and feel like it needs to be really special and take a lot of time. But in reality, it doesn't. 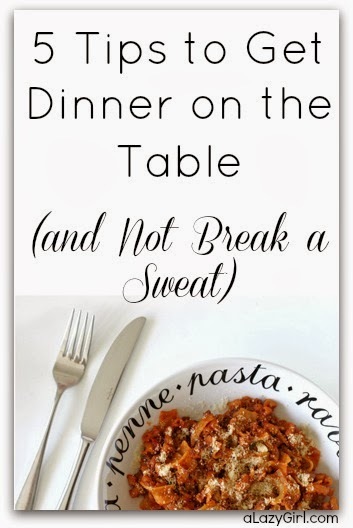 Give yourself a break, easy dinners can be just as satisfying as difficult ones.